The hill is called Picts Hill. The vilage - Pickhill takes it's name from this hill. Pickhill is in the Domesday book. On the 1st edition OS there is a long mound and a short mound marked in the field next door, as well as some "mound foundations" and an earthwork. None of these are easily spotted today. "A large artificial mound here, apparently raised for defensive purposes, bears the name of Picts' Hill, and an improbable belief prevails that the Picts defeated the Romans in battle at a spot, not far off, called Roman Castle. This mound is also known as Money Hill, but, though partially cut away for the construction of the railway, the traditionary hidden treasure was not found." 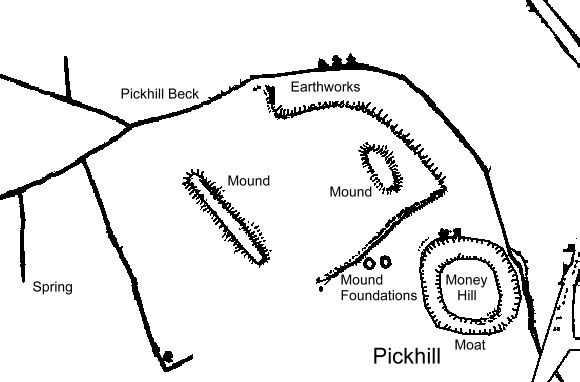 Bulmer's History and Directory of North Yorkshire (1890) "There is a large artificial mound at Pickhill called Pict's Hill (or Money Hill), which now forms part of the railway embankment. Mr Longstaffe gives the following particulars, for which, he says, he is indebted to his friend M. M. Milburm, Esq., land agent, Thirsk. Mother Shipton is said to have prophesied that Pickhill would never thrive till a certain family became extinct, and Picks or Money Hill was cut open. Some years ago an old man dreamed that there was an archway in the hill, beneath which was a black chest, with three locks, containing the money which gives the name to the mound. Well, the family did become extinct in 1850, and the Leeds and Thirsk railway Company cut the hill open in 1851 - though it naturally formed part of its embankment, and their line passes over it. Still the directors ordered it to be excavated - the old man, the dreamer, was still alive, and pointed out the spot where the archway lay. The hill was cut through in all directions, but nothing was found, save in the foss, where portions of tile and a small brick, both vitrified on one side, and fragments of urns, and a piece of thin iron, like the crest of a helmet, were discovered. 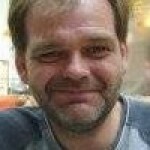 The mound was squarish, 113 by 80 feet, and surrounded by a moat." Wellans History and Topogrphy of York and North Yorkshire. 1859.